October 7th, NYC area fans of the CW's "Arrow" will gather to watch the premiere & raise funds for the Hope & Heroes Children's Cancer Fund. This campaign is for fans everywhere to participate & spread as much good karma as possible. Since the launch of CW’s “Arrow” in 2012, the show’s fan base, affectionately referred to as “Team Arrow,” has quickly become a large, impactful community. The inspiration behind the community and this event, is the show’s philanthropic star, Stephen Amell. Amell is also responsible for creating the now popular word “Sinceriously” to initiate any action while spreading as much good karma as possible. 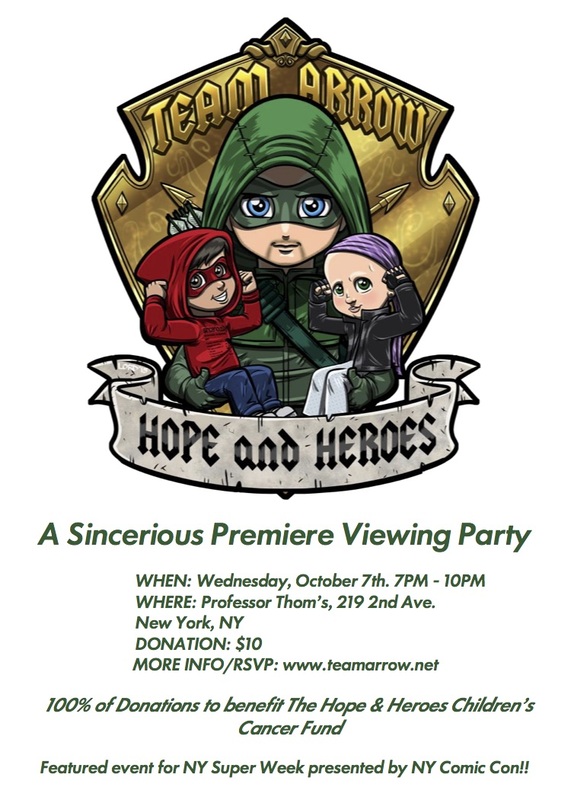 In an effort to continue the success of the Season 3 Finale Party (which raised nearly $3000), on October 6th, that is exactly what “Team Arrow: Hope & Heroes – A Sincerious Viewing Party” is set to do. This campaign, featuring art designed by "Fan Art Friday" favorite, Lord Mesa, is to complement the Viewing Party and allow fans from all over to contribute and be a part of the fundraising efforts for The Hope and Heroes Children's Cancer Fund.